not all Christians hate Halloween. – sam finds faith. not all Christians hate Halloween. Halloween. Even just today, more than a month out from the unofficial holiday, I’ve already begun seeing things popping up in my newsfeed like “10 reasons why Halloween is evil” and I’m sure you’ve seen a bunch too. Now, before I get ahead of myself… Witches are real, demons are real, and death is real. Satan is real, also, and so is evil. Don’t get me wrong, I do NOT in any way advocate for those traditional Halloween staples. Those characters are born of evil and should not be celebrated. And I’d also like to leave a little disclaimer here that this is my personal blog and is no way really instructional in function, it is more about my life, what the Lord is doing in me, and what I’m learning. So keep that in mind. I’m not trying to change you I only wish to share how we do things in my family, and what I’ve learned through my research into this topic by digging into the Bible as well as checking out other reliable and Biblically based sources. So, with that being said… This is how we celebrate Halloween. We carve pumpkins. We don’t really call them jack-o-lanterns, unless I’m explaining to someone what that means. 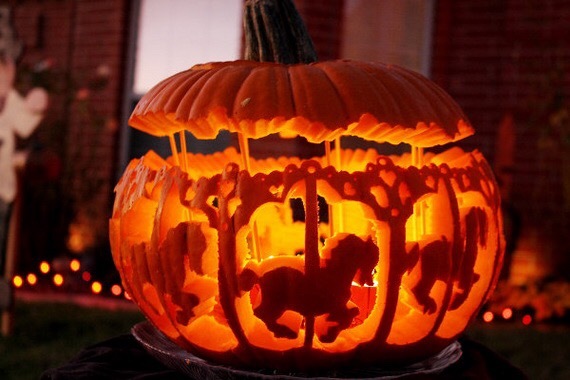 We call it pumpkin carving. It’s my understanding that there is a folklore legend about a man named Jack who cut some deal with the devil and he couldn’t get into heaven or hell and so people would carve scary faces into vegetables and put them in their windows to ward off his evil spirit. Personally, I have Jesus for that. But! I know that my Creator made me to be His image, and in His image we are supposed to create things. 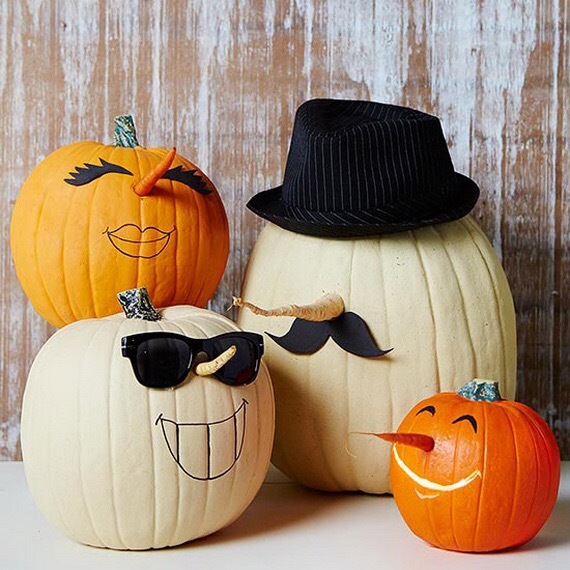 We were made to be original and creative like our Father, and so I submit this question about carving pumpkins: why can’t it just be art? My husband and I have so much fun with my daughter carving pumpkins because we get to share a creative experience together (and we laugh when we squish our fingers in all the gooey goop inside!!) and it’s a beautiful thing. We really try hard to create beautiful carvings and sculptures out of a vegetable and I think that it’s awesome. I’m not making scary faces to ward off an evil spirit, and most people aren’t – we’re creating. We dress up in costume. This is again something that I know is quite controversial because, from my understanding, the concern is that people dress up to be something they are not. But to this I almost have a challenging push-back and I’ll try to say this as gracefully as I can: how is that any different than what most of us do on a daily basis? People every day – Christians… Insanely devout and upstanding members of our church congregations – are daily pretending to be something they are not. Everywhere there are Christians pretending like life is all together and is peaches and rainbows and that they aren’t literally broken and shattered and sinful people surviving only by the Grace of God. This is something that goes deeper than children’s costumes and I implore you that if this is your stance on costumes for Halloween, please make sure there isn’t a plank in your eye before worrying about the fleck of dust in another. Another note to add on this, as I mentioned before, characters of evil should not be celebrated. My daughter and I had a long talk about why she would not be allowed to be a vampire for Halloween, but was allowed to her first choice: Dorothy from the Wizard of Oz. And I’m sure that someday, we’ll have another talk about why her costumes must cover more of her body than lingerie. But in her five short years of life, she has been a flower, a cupcake, a monkey, a princess, and a cowgirl. None of these is inherently evil and she is no more susceptible to an evil attack than when she plays imaginatively, pretending to be a Barbie named Alliyana who lives in a 3-story Barbie house with an elevator and two sisters and a pool. She has only actually Trick-or-Treated once. Trick-or-Treating has sort of changed, as we began celebrating a more harvest-themed event at our church for Halloween instead, where kids can Trunk-or-Treat and don’t have to have costumes and there is a lack of scary Halloween decorations on the lawns of well-meaning neighbors to scare her (and disturb me). So that’s the third thing we do: we eat CANDY!! We are supposed to be reclaiming culture and not rejecting it. What was intended for evil can be reclaimed for good (Genesis 50:20). It happened to Joseph, it can happen for Halloween. I’m not talking about embracing the Day of the Dead feel about Halloween, but I really question what the world thinks of us if we just pretend it’s not a thing or worse, only tell them that it’s evil. Here’s the thing: the world thinks we’re crazy. And the stuff that Christians say makes them think this way (and sometimes, I even agree with them, sadly). While lying and saying that these things are acceptable is wrong, to ONLY tell them that Halloween is evil isn’t going to win hearts for Christ. If we want to reclaim this culture we’re living in we actually have to get out of the safety of our boats and walk on the water their drowning in and offer to LOVE THEM. Walk with them. Share life with them. And if we don’t get it right 100% of the time, and we stumble for a little while to figure it out, I know and believe in my heart that God meant what He said when He said “My grace is sufficient for you.” His ministry isn’t dependent upon our perfection. But they need to know them that there is life beyond what they’re doing, you’re not expected to be perfect by the standard of “churchy people” and mortal men, and, for crying out loud, that fun CAN be had if you’re a Christian. My daughter attended a dance party on Halloween two years ago, and they launched rolls of toilet paper and candy into the crowd of kids. That’s a BLAST. That’s reclaiming. We take a tradition that was created in some sort of weird superstition and turned it into something we do to glorify God! That’s reclaiming. Psalm 24:1points out that everything belongs to the Lord. Therefore, there is no reason to let Satan have Halloween. It should be obvious from a Christian perspective that many modern practices of Halloween and days of the dead have evil intent (e.g., 1 Corinthians 10:20). There has been considerable paganism that has been associated with Halloween over the years. Even evil acts such as vandalism, fires, destructive pranks, pretending people are something they are not by dressing up (and particularly by the glorification of sensuality, death, and demons) are in strong opposition to the fruit of the Spirit (Galatians 5:19–23). So, a word of caution must be given to Evangelicals who promote some of the questionable modern practices of Halloween. When Satan tried to tempt Jesus, he offered Jesus something that was not his to offer (Matthew 4:8 – all the kingdoms of the world). Jesus obviously didn’t succumb because it wasn’t Satan’s to give, nor did Satan exercise any authority over Him. Many today believe that Halloween is Satan’s day and recommend staying away from it. But recognizing such a thing would be to disregard that Satan owns nothing and that all days belong to God. Christians can take this day and make better use of it, such as by celebrating Reformation Day, a harvest festival of praise for a God who provides, an extra day of the Lord’s Supper to remember Christ’s sacrifice to end animal sacrifices, and so on (Colossians 2:16–17). Death is a terrible reality for all of us—not something to celebrate or treat as fun. Death is the punishment for sin. Since all of us are sinners (Romans 3:23), we must realize that death is coming. But God is a God of grace and mercy, and in His love He has offered a means of salvation through His only begotten Son, Jesus Christ, who suffered and died the ultimate death in our place. All who repent and believe can receive forgiveness of sins and eternal life. Everything in this world belongs to God, and as for me and my house, we choose to act like it. Let’s live with more love and love with more grace, no? Previous postsin is something you do, not who you are. Next post11 ways God works for me.